The 1917 H801-8 Boston Store baseball card set is one of the most difficult to complete of any Pre-War set. There are a total of 200 cards that measure 2” by 2¾”. The cards were printed on thin paper stock, making them very difficult to find in good condition. 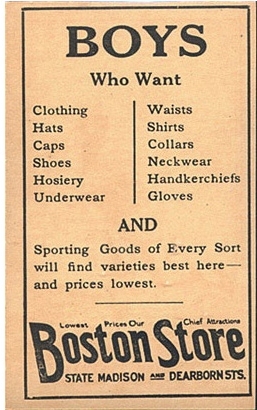 The Boston Store cards can be easily identified by the advertisement on the back, which was intended for young boys who would have been interested in baseball cards. The Boston Store baseball cards may be related to the E135 Collins-McCarthy set, released the same year. The Collins-McCarthy cards have the same design on the front, but feature an advertisement for candy on the back. There are a total of five variations in the Boston Store set. They are all either differences in sock color or the wrong person is in the picture. This set is particularly expensive because it features Ty Cobb, Babe Ruth, and Shoeless Joe Jackson. 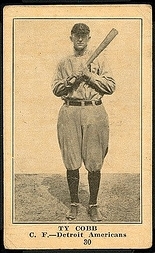 Cobb was in the middle of his career and had finished in the top 20 of the MVP race for four years straight (1911-14). He won the MVP award in 1911. Ruth was still in the early stages of his career. 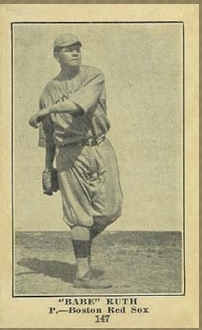 At the time, he was still a member of the Red Sox, but would be traded to the in 1920. Shoeless Joe was a few years away from the 1919 World Series and the infamous Black Sox Scandal. Like Cobb, Shoeless Joe had finished in the top ten of the MVP voting from 1911 to 1914, finishing second in 1913. Boston Store was a department store in the Chicago-area and the Midwest. The advertisement on the back has store locations in downtown Chicago. Established in1897 by the Stone family in Milwaukee, Boston Store would later be purchased and re-sold several different times during the 20th century and is still in existence today. Here at DeansCards.com, we are always interested in purchasing Boston Store and other Pre-War baseball cards. If you are interested in selling these or other cards, please click here. If you are interested in viewing our inventory of Boston Store cards, please click here.